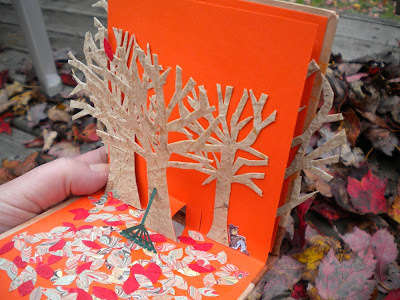 This is my first attempt at making a pop-up book. I didn't attempt any amazing pop-up structures; I just attached my trees to little pop-up squares made with two cuts on the fold. I've submitted this book as part of a BEST challenge so you can vote for it if you like it! Or vote for whichever you like best - by visiting the BEST blog. There are some really great entries in the challenge this year. So, this is a Time for Patience. A handmade pop-up book to celebrate the procrastination innate in leaf raking. No sense starting until every leaf has fallen. It is a 2-page pop up. So the first pop-up spread is a tree, barren of leaves, except for one at the top. The second spread is a wider scene of that same tree and a couple others, with the rake and the raker and the fallen leaves, all waiting patiently for that last leaf to fall. 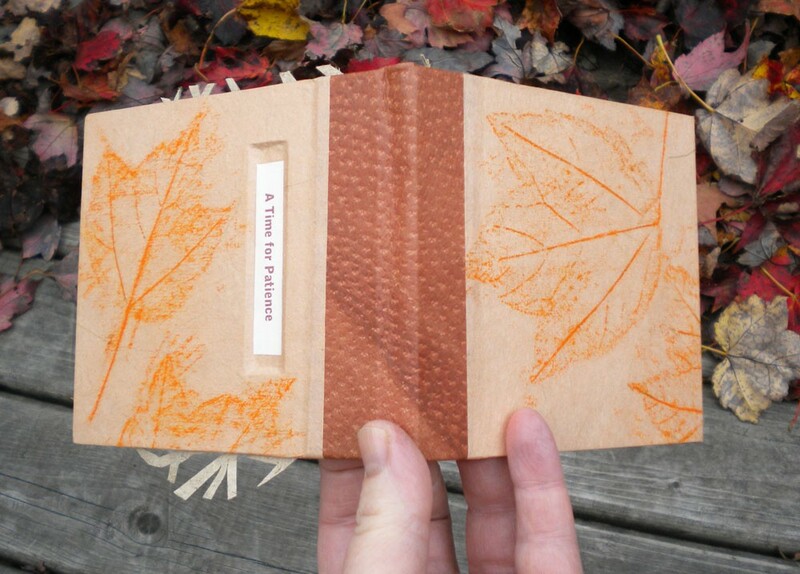 I also collected a few leaves and made some rubbings which are used on the covers of the book. Leather spine. I can't believe this is your first pop-up book. You did a great job with it. I love the fall theme, and the way you portrayed waiting for that last leaf to fall before raking is wonderful. Great job. I love it! Aren't pop-ups fun? Thanks Linda and Niko. Yes, it was a lot of fun! So much potential with pop-ups, and I could start to see how amazingly complicated they could become. I find it hard to believe this is your first pop-up too! You may have used a simple structure, but it's very elegant in its execution. The theme of waiting for the last leaf to fall has great appeal. 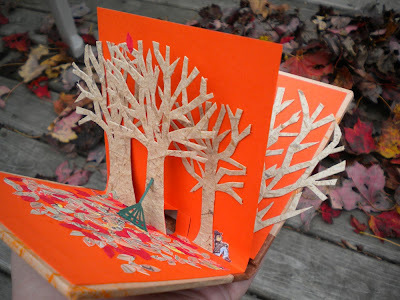 I like how the tree branches are not contained by the pages, but peek out from the edges; also how you have stuck lots of leaves to the page, to look like a real leafy garden. And I love the bright orange pages, leaf-print cover paper and the leather quarter-binding. It's just a great little book altogether! wow i love it! can't believe its your first one either! images of trees rank among my most favorite things. What an awesome job you did! It looks great! Hi! This is my first time visiting your blog and I am so impressed! 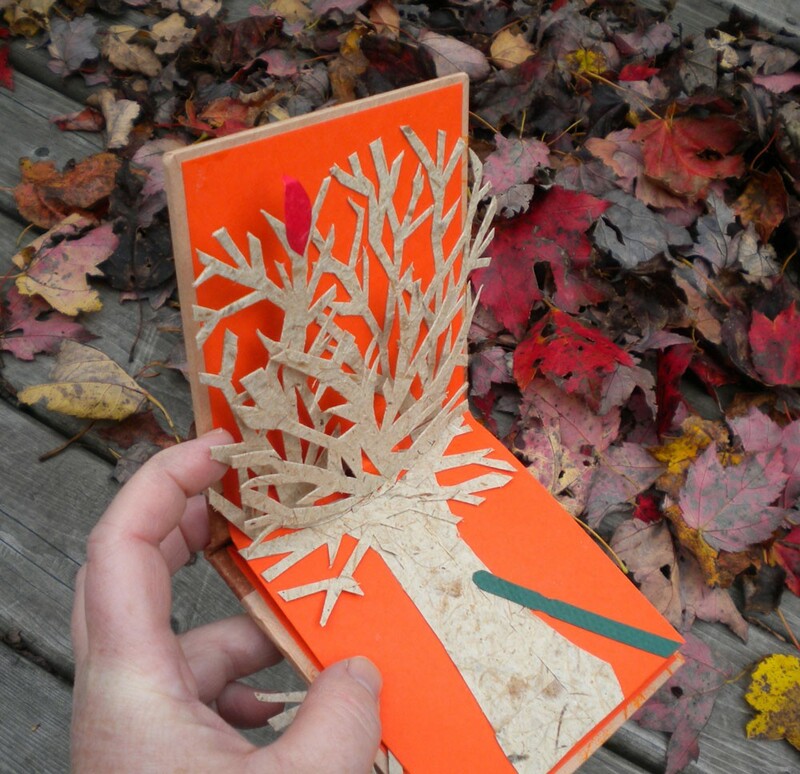 I have only been in the bookbinding world for about a year but I love it! I was wondering how you made the rub-ons of the leaves. They are beautiful! Do you share? Thanks! and thanks for all the kind words, uberart, Randy, Dolores, ashley, richard, laura, and Lizzie!! Fabulous! Love the concept and the execution. That looks great! It's very impressive that you tried making a pop-up book. Good job! Hi! I was just wondering how did you bind your book? This book is just two folded sheets, pasted together, then pasted into the book. So it was all about paste. No sewing.